Andhra Pradesh Polytechnic Common Entrance Test (POLYCET) also known as CEEP 2018 document verification notification released by State Board of Technical Education and Training at http://appolycet.nic.in. 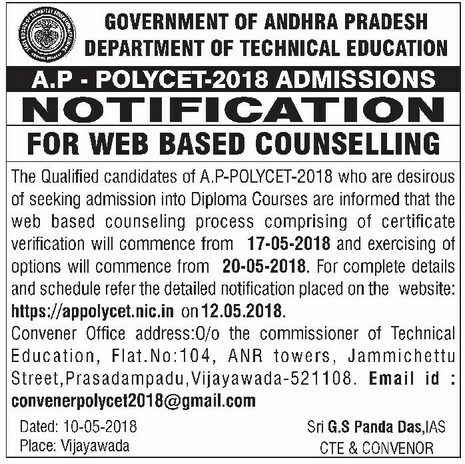 AP POLYCET 2018 rank wise web counselling and Document verification dates available here. All the candidates who qualified in AP Polytechnic entrance test and willing to join in 3yrs or 3 1/2 yrs diploma courses in Engineering / Non Engineering/Technology offered at Polytechnics / institutions can attend Certificate / Document Verification according to their Ranks. Rank wise schedule & help line centers are available here. All the qualified candidates of AP POLYCET-2018 Examination are informed to attend the certificate verification for exercising web options for the academic year 2018-19 on the dates mentioned against their state-wide rank, at the Helpline Centers (HLCs) with all required documents. Certificate Verification from 17th May, 2018. Exercising of web options from 20th May, 2018. Last Date for Exercising of web options 25th May, 2018. All the candidates who completed certificate verification can exercise web options from https://appolycet.nic.in. ఓసీ ,బీసీ విద్యార్ధులు 600 రూ లతో కౌన్సిలింగ్ కు హజరు కావాలన్నారు. 23-05-2018 - 84001 నుండి చివరి ర్యాంకు వరకు . Accordingly the qualified candidates of AP POLYCET 2018 and Non qualified Minority Candidates who have applied to the Convenor based on SSC Marks are informed to attend for certificate verification in any one of the Help Line Centres indicated below and as per the schedule given under, with all original certificates and two sets of Xerox copies of Following documents. Accordingly, the qualified candidates of A.P-POLYCET-2018 and Non-qualified Minority Candidates who have applied to the Convenor based on SSC Marks are informed to attend for certificate verification in any one of the Help Line Centres indicated below and as per the schedule given under, with all original certificates and two sets of Xerox copies listed below. CAP Category: Candidates have to produce a certificate issued by Zilla Sainik Welfare Officer (In case of Ex-Service Men), Identity Card and Discharge Book for verification. Candidates whose parents are domicile of Andhra Pradesh are eligible under CAP Category. The decision of authorities of sanik welfare of A.P is final in this matter Anglo-Indian Candidates have to produce a certificate issued by Competent Authority of their place of residence. NCC & Sports: To produce Original Certificates issued by competent authorities. Anglo Indian: A Certificate issued by Tahsildar the competent authority of their place of Residence. Candidates are informed to carefully check all the documents mentioned in “Check List for AP POLYCET Certificate Verification” above. Candidates also check Detailed AP POLYCET 2018 Counselling Notification.